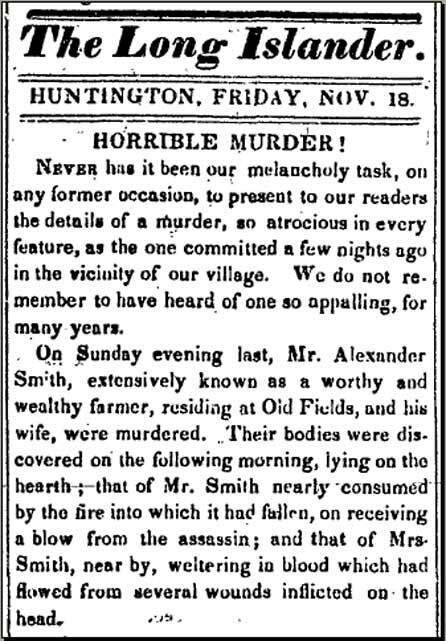 The article below was printed in The Long Islander newspaper on Friday, November 18th, 1842, just five days after the heinous double-murder of Alexander and Rebecca Smith, a prominent, wealthy, and well-respected married couple who ran Smith Farm, in what was then known as Old Fields (now Greenlawn) on Long Island, New York. The crime made nationwide news, as much for the gruesome manner in which it was committed, as for where it occurred – in front of the hearth of a quaint and prosperous farmhouse, in a peaceful, quiet, rural farming community. Because of this crime, the house itself, which still stands today in Greenlawn, New York, became notorious. Some said it was haunted by ghosts; others pointed to the geraniums in the front window, which seemed to bloom all year long, defying the regular cycles of nature. The reclusive heirs to the Smiths lived in the farmhouse until 2003. The house fell into disrepair, and took on the chilling appearance of a haunted house. It seemed like any other Monday morning for George Weeks, who was reporting for work as a farmhand at Smith Farm on November 14th, 1842. As he normally did, he walked to Smith Farm from his house about a quarter of a mile away. As he approached the Smith Farm property, something immediately caught his attention. Mr. Smith’s dog was barking wildly from within the workshop, located some distance from the farmhouse. This was unusual because Mr. Smith usually kept his dog with him overnight in his bedroom. Mr. Weeks then noticed that the window to the east room of the farmhouse was shattered. Now suspicious of foul play, he looked into the window at the front of the house, and saw Mr. and Mrs. Smith lying on the floor, covered in blood. Weeks immediately ran back to his house for help, and returned soon after with a few neighbors. Upon entering the house, they saw that Mr. and Mrs. Smith had been murdered. The Suffolk County Coroner, Darling B. Whitney, reported that Alexander (Smith) lay with his head away from the fire place, his body was chiefly consumed (burned) up to his 3rd or 4th rib. Mr. Smith was in the habit of sitting in front of the fire after tea with his feet on the fireplace crane that hung over the fire. It was surmised that, after a blow to the head, he fell off his chair, and the fireplace crane swung his feet into the fire, which then burned the lower part of his body. Rebecca Smith’s body was found next to her husband, to his right. Whitney reported that: Mrs. Smith was lying in the right corner of the fireplace; her head at the corner of the hearth… her dress was bloody down to her waist…She seems from appearances to have struggled. There was blood in the middle of the floor, and spread to the place where she lay. Blood droplets were found elsewhere throughout the house; various footprints were also discovered, as were a hammer and an axe at the crime scene, which may have been used to commit the murders. Four people connected with the Smith family have been determined to be suspects – George Weeks not being one of them because his alibi checks out with multiple sources. The following is a more complete excerpt from the deposition (an out-of-court testimony made under oath) taken from Darling B. Whitney, who was called to the crime scene at about 1 p.m. on Monday, November, 14th. Alexander lay with his head from the fire place, his body was chiefly consumed up to his 3rd or 4th rib. His body was examined in his presence by Dr. Ray; there were three wounds on the left side of his head, immediately over the lower portion of the cartilage of the left ear – making three holes through the cartilage; large cut at the interior and posterior cartilage of the same ear. The skull was fractured on the top of the head. The wound must have occasioned the death – wounds must have been inflicted with some heavy instrument like a hammer, with a flat end. No appearance of his having struggled. He thinks deceased must have been lying upon his back when the wound upon the top of his head was inflicted. 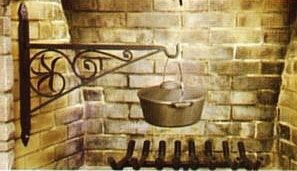 Mrs. Smith was lying in the right corner of the fireplace; her head at the corner of the hearth. She has two wounds upon the forehead, one producing a fracture of the skull, the other a depression. There were four wounds upon the upper and posterior part of the head, one creating a depression of the bone – supposes the same instrument must have inflicted the wound that caused the death of Alexander – her dress was bloody down to her waist: supposed some of the wounds on Mrs. Smith’s head to have been inflicted when she was lying down. Her death must have been occasioned by the wounds referred to. She seems from appearances to have struggled. There was blood in the middle of the floor, and spread to the place where she lay. From their positions, thinks Mr. Smith must have been killed first.